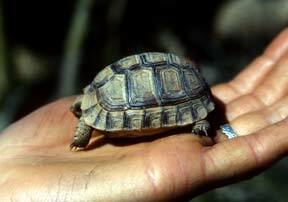 Tortoise Trust Web - Basic care of Mediterranean tortoises. This is a very basic introduction to keeping Mediterranean tortoises of the genus Testudo, with special reference to Testudo graeca, Testudo hermanni and Testudo marginata. Mediterranean tortoises may well have been among the most popular European pets of the last 100 years, but for all that, most keepers know surprisingly little about them. The Tortoise Trust has, of course, done its best to put this right; even so, we are continually astonished at some of the questions that crop up repeatedly in our mailbox or on the ‘phone…. It is worth highlighting some of the more frequent issues here. 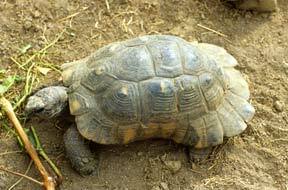 Mediterranean tortoises in the wild consume mainly flowers, stalks, and green leaves. They rarely encounter fruit, and never encounter tinned dog food, ice-cream, bread, pizza, cheese, cakes or some of the other bizarre “treats” some people seem to think they should be offered. Most of the tortoises that are fed these inappropriate diets suffer serious, permanent, damage as a result. Many die. Don’t do it – and if you are given a tortoise addicted to such foods, break the addiction immediately. Do not give in, but allow the tortoise to become sufficiently hungry so that it resumes a normal, healthy diet. This may take some time – in the interim, offer only safe and healthy foods. In captivity, a high fiber, low protein and calcium-rich diet will ensure good digestive tract function and smooth shell growth. Mediterranean tortoises fed on cat or dog food, or other high protein food items such as peas or beans, frequently die from renal failure or from impacted bladder stones of solidified urates. Peas and beans are also very high in phytic acid, which, like oxalic acid, inhibits calcium uptake. Avoid reliance upon ‘supermarket’ greens and fruits which typically contain inadequate fiber levels, excessive pesticide residues, and are too rich in sugar. Fruit should be given very sparingly or not at all as it frequently leads to diarrhea, intestinal parasite proliferation, and colic in these species. Fruit is, however, a routine part of the diet of many tropical species. See separate caresheets and information relating to these. They are totally different from Mediterranean species. Unfortunately, some very misleading advice on this topic has appeared in print in ‘pet care’ books. Tortoises do drink, both in the wild and in captivity. Drinking is not a sign of ill-health (although a sudden change in drinking behaviour may indicate that there is a problem). Ensure that fresh water is offered daily. Most tortoises prefer to drink by entering a shallow dish or pool – and can often be stimulated to drink by spraying lightly with a garden hose in fine weather. Drowning. Yes, it happens every year. If you have a pond, make sure that it is completely safe and is 100% ‘tortoise-proof’. Mediterranean tortoises cannot swim, and any open pool or pond should be considered as a major hazard. Foxes, hedgehogs, racoons (USA), badgers, rats, dogs and even large birds can attack and kill tortoises – especially juveniles. Ensure that all outdoor accommodation is 100% secure. If in doubt, bring tortoises in at night. Male tortoises are typically territorial. Two males can fight quite viciously, sometimes causing serious injuries. Keep such males separately. In a restricted enclosure, males can also cause severe stress and injury to females. Enclosures need to be sufficiently large to permit escape and hiding from unwanted attentions. On no account, overcrowd tortoises into an area that is too small. It’s a sure recipe for trouble. Placing elderly females with younger, active males is also extremely risky. We advise against this. Never mix species. We have lost count of the tales of anguish and woe from people who have “taken a chance” on this – and who have come badly unstuck. For every case where someone gets away with it, we estimate that there are 10 others who don’t. Allowing different tortoises, from other collections, to “meet” your own is also highly dangerous. We advise strongly against taking such a risk. There are a number of fatal, non-treatable viral diseases out there. It only takes one contact, and you could very easily lose every tortoise you have. Never underestimate this danger. It is very real. Small pens on grassy lawns are not suitable. Fishtanks are not suitable. Tortoises are highly sensitive to their environments. They make extensive use of “microclimates” and have very specific needs in terms of temperature, space, and humidity. A well-designed tortoise habitat (whether indoor or out) can be both attractive and functional. Some excellent examples are shown on the “Practical Care of Mediterranean (Greek) Tortoises” video from Carapace Press. It takes effort to provide genuinely satisfactory accommodation – but your investment will be well repaid by having happy tortoises, better breeding success and lower veterinary bills.